This sounds like perfect picnic fare...or a great lunch for work! Thanks for sharing! . . . . and it's so easy, too! Guess you could cram a lot in a little pressed sandwich! This looks good. I have to try it sometime. 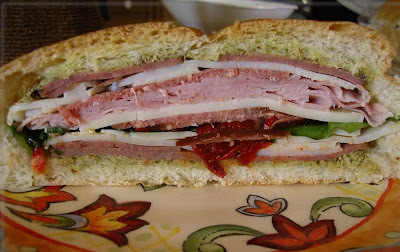 An awesome sandwich, I love all the cold cuts in it! I will be going to make my own a sandwich like that, thanx for posting. This looks good. Guess you could cram a lot in a little pressed sandwich! I have to try it sometime. Make my own version of this, saw some of Martha's but my people are more ranch oriented so after I take the loose bread out I put a mixture of chream cheese, ranch dry mix and mayo, spread it on thick, do the cold cuts and cheese ( use variety) add some thinly sliced red onion and have served it to class reunions, kids, cousins, you name it. All love it. Took some in a roaster pan for church pot luck and someone mistakenly put it in the oven, was even good warm. Press it, yes yes yes.